"From the time I was arrested five years ago, they have been torturing me." 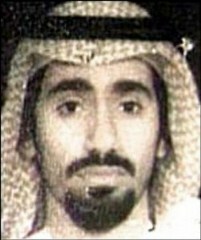 Abd al-Rahim al-Nashiri is a Saudi national who was captured in October 2002 and spent nearly four years in secret CIA detention before being transferred to Guantánamo Bay in September 2006. He is one of the ‘High-Value Detainees’ (HVDs) identified by the US Government, and was subjected to a range of ‘enhanced interrogation techniques’ during his time in CIA custody, including waterboarding. The US Government accuses al-Nashiri of being ‘one of al-Qaeda’s most skilled, capable and prolific coordinators’, who reported directly to bin Laden and was responsible for numerous attacks against the West (including the USS Cole and MV Limburg attacks). It is known that al-Nashiri was captured in Dubai towards the mid-October 2002, although the precise dates, location and details of the capture are unclear. According to al-Nashiri, speaking to the International Committee of the Red Cross, he was detained and interrogated by Dubai agents for the first month after his capture, before being transferred to Afghanistan. This was confirmed by former US intelligence officials talking to the Associated Press, who stated that al-Nashiri was taken to the secret CIA in Afghanistan called the ‘Salt Pit’. CIA records cited by the SSCI report confirm that he was rendered to the CIA-run DETENTION SITE COBALT in Afghanistan on [redacted] November 2002, where the redaction is a double-digit figure. Analysis of flight records held by The Rendition Project confirm a flight between UAE and Afghanistan in November 2002, by the Gulfstream IV jet with registration N85VM – an aircraft involved in multiple renditions. Records show that the aircraft landed in Afghanistan between 10-11 November 2002, thus delivering al-Nashiri to CIA custody2. Click here for our analysis of the flight data and documentation associated with al-Nashiri’s likely rendition from Dubai to Afghanistan. Once in Afghanistan, al-Nashiri says his wrists were tied to a bar in the ceiling, and he was kept naked in a painful position with his feet just touching the floor. The SSCI report states that he was held at COBALT for [redacted] days, where the redaction appears to be a word rather than a figure, and is exactly the length of the word “five”. [Redacted] psychologist/interrogators began al-Nashiri’s interrogation using EITs immediately upon his arrival. Al-Nashiri provided lead information on other terrorists during his first day of interrogation. On the twelfth day of interrogation, [redacted] psychologist/interrogators administered two applications of the waterboard to al-Nashiri during two separate interrogation sessions. Enhanced interrogation of al-Nashiri continued through 4 December 2002. CIA records cited by the SSCI report confirm that al-Nashiri was waterboarded three times whilst in GREEN, amongst the use of other torture methods. He was then transferred, in December 2002, to DETENTION SITE BLUE, alongside Abu Zubaydah. By reading the heavily-redacted report by the CIA Inspector General alongside the heavily-redacted DoJ report – importantly, where each report has a slightly different scope of declassification – it is possible to determine that al-Nashiri on 4 December 2002. Flight data and associated documentation confirm this transfer, and the location of GREEN and BLUE: on 4 December 2002, a Gulfstream IV jet linked to the CIA renditions programme (registration number N63MU) flew from Thailand to Poland, where it is known that another CIA black site was located. Click here for our analysis of the flight data and documentation associated with al-Nashiri’s rendition from Thailand to Poland. Once detained in BLUE, CIA records cited by the SSCI report confirm that al-Nashiri was subjected to CIA EIT’s between 5-8 December 2002. Following this session, interrogators at BLUE concluded that al-Nashiri was compliant and cooperative. This assessment was criticised by officers at CIA Headquarters who warned against “sweeping statements” in cable traffic, and instead sought to reinstate the use of the CIA’s EITs. Records cited by the SSCI report note that, in [redacted] December 2002, where the redaction is a double-digit, CIA Headquarters sent CIA OFFICER 2 to resume the interrogation of al-Nashiri, despite having received no training as an interrogator and having a previous history that suggested against his suitability. In subsequent interrogation sessions, records showed that OFFICER 2 used a series of unauthorised techniques, including threatening to sexually abuse the detainee’s mother, raising a pistol to his head, and holding a cordless drill to the detainee’s body. Although the name of the officer is redacted from the Inspector General’s report, Adam Goldman at the Associated Press has spoken to former intelligence officials who have identified him as ‘Albert’, who had worked for the FBI as a linguist. On [redacted] January 2003, where the redaction is a double-digit, CIA contractor DUNBAR arrived at BLUE to assess al-Nashiri’s psychological condition. CIA cables note that DUBBAR recommended interrogators have the “latitude to use the full range of enhanced exploitation and interrogation measures”, including the possibility of waterboarding. Disagreeing with this assessment, the CIA’s chief of interrogations sent an email to colleagues threatening to quit, and referring to the CIA detention and interrogation programme as a “train wreak [sic] waiting to happen”. The chief of interrogations also warned against what he identified as a “conflict of responsibility”, given CIA contractor DUNBAR’s position as both a psychologist and interrogator. CIA Headquarters never disseminated these concerns to interrogators at BLUE and instead reinstituted the use of the CIA’s EIT against al-Nashiri, beginning with shaving his head, removing his clothing, and placing him in a standing sleep deprivation position with his arms affixed over his head. Al-Nashiri was held in Poland for six months. Then, according to the SSCI report, “the CIA transferred al-Nashiri to five different CIA detention facilities” before his eventual transfer to US military custody. On 6 June 2003, according to the former officials speaking to Adam Goldman, he was transferred to Rabat, Morocco, alongside another detainee, Ramzi bin al-Shibh (who had been held in Poland since February 2003). Flight data confirms a transfer on this date, and demonstrates that both men were moved on board the CIA-owned Gulfstream V jet with registration N379P. The rendition was arranged by the company Jeppesen Dataplan, and was disguised by the filing of ‘dummy’ flight plans to hide the landing in Szymany, Poland (the airport which serviced the CIA black site). Analysis of the flight records also shows that Jeppesen used two special designators in their flight plans, STS/STATE and STS/ATFMEXEMPTAPPROVED, to denote the official status of the flights. Click here for our analysis of the flight data and documentation associated with al-Nashiri’s rendition from Poland to Morocco. Little is known about al-Nashiri’s treatment in Morocco, or his exact whereabouts, other than the fact that he was in a locally run site whilst the CIA continued to construct its own facility in the country. According to the former officials speaking to Goldman, the detainee was transferred again on 22 September 2003, this time to a secret CIA prison in Guantánamo Bay. The SSCI report confirms this, and the parallel rendition of Ramzi bin al-Shibh. The aircraft that picked them up – the CIA-owned Boeing 737 with registration N313P – had already been to Afghanistan, Poland and Romania, and had two other ‘High-Value Detainees’ on board: Abu Zubaydah and Mustafa al-Hawsawi. Click here for our analysis of the flight data and documentation associated with al-Nashiri’s rendition from Morocco to Guantánamo Bay. Al-Nashiri was kept in CIA detention in Guantánamo Bay for a further six months, before being transferred back out again in March or April 2004 (along with the other ‘High-Value Detainees’ brought to the island with him). This further transfer of the detainees considered most valuable by the CIA came as developments in the US courts made it likely that detainees held on the island would be afforded some basic rights under US law. According to one US official speaking off the record, 'anything that could expose these detainees to individuals outside the government was a nonstarter', necessitating their removal from Guantánamo. There are conflicting accounts of where al-Nashiri was taken in the Spring of 2004. According to one account from former intelligence officials (here and here), the detainee was transferred with the other HVDs back to Morocco on 27 March on board the CIA-contracted Gulfstream IV jet with registration number N85VM. After this second period of time in Morocco, ‘he was moved to another CIA prison in Bucharest, Romania, living with five other detainees before surfacing in Guantánamo again’. Flight data and associated documentation confirms that N85VM was contracted within the overall CIA contracting programme to fly Guantánamo Bay-Morocco on 27 March 2004, making it likely that this was indeed a rendition circuit. Click here for our analysis of the flight data and documentation associated with the March 2004 rendition of HVDs from Guantánamo Bay to Morocco. If al-Nashiri was held in Morocco for a second time from March 2004, it is unclear exactly when he was moved to Romania. The Rendition Project Flight Dataset contains two possible candidates for this rendition: an October 2004 flight from Morocco to Romania by the Gulfstream IV with registration number N85VM, and a February 2005 flight from Morocco to Romania and Lithuania by the privately-owned Boeing 737 with registration number N787WH. However, a series of Council of Europe (CoE) investigations which were published in a March 2012 memo to the Prosecutor General of Romania, headed Advancing Accountability in Respect of the CIA Black Site in Romania, place al-Nashiri on a flight from Guantánamo Bay direct to Romania on 12 April 2004, two weeks later than the flight to Morocco. Again, flight data and associated documentation confirms that N85VM was contracted to fly Guantánamo Bay-Romania-Morocco on 12-13 April 2004. Click here for our analysis of the flight data and documentation associated with the possible April 2004 rendition of HVDs from Guantánamo Bay to Romania and Morocco. Whether held in Morocco for a second time or not, the evidence suggests that al-Nashiri was detained in the CIA black site in Romania for some period of time between April 2004 and the end of 2005 when the prison is thought to have been closed. Little is known, however, about al-Nashiri’s time in Romania, or even the length of his detention in the black site. The Council of Europe’s 2012 investigation into the prison in Romania found that detainees who had been moved to Romania from other CIA sites had, by that time, been considered to have lower intelligence value after some months in secret detention. This set of detainees, according to the report, were less likely to have been subjected to ‘enhanced interrogation techniques’ while in Romania (which was not the case for ‘High-Value Detainees’ such as Janat Gul and Abu Faraj al-Libi, who were captured during 2004-2005 and taken directly to Romania for ‘enhanced interrogation’). Very little is known about the fate and whereabouts of al-Nashiri and the other ‘High-Value Detainees’ after their time in Romania. Most were likely moved during 2005, with evidence pointing towards Lithuania and Afghanistan as the final detention sites before their final transfer out of secret detention in September 2006. Click here for an analysis of where the ‘High-Value Detainees’ – including al-Nashiri – may have been held during 2005-2006. As a result of his time in prolonged secret detention, CIA records document that “he was diagnosed by some CIA psychologists as having "anxiety" and "major depressive" disorder, while others found no symptoms of either illness. He was a difficult and uncooperative detainee and engaged in repeated belligerent acts, including attempts to assault CIA detention site personnel and efforts to damage items in his cell. Over a period of years, al-Nashiri accused the CIA staff of drugging or poisoning his food, and complained of bodily pain and insomnia. At one point, al-Nashiri launched a short-lived hunger strike that resulted in the CIA force feeding him rectally.” This rectal feeding was reported in cables dated 23 May 2004, when al-Nashiri was likely held in either Morocco or Romania. Ensure was “infused into al-Nashiri “in a forward-facing position (Trendlenberg) with head lower than torso.” By July 2005, CIA Headquarters was concerned about al-Nashiri’s “continued state of depression and uncooperative attitude”, and a CIA psychologist assessed him as being on the “verge of a breakdown”. CIA records show that al-Nashiri was transferred out of the CIA’s secret prison network and into US military detention in Guantánamo Bay on 5 September 2006, after more than three and a half years (1394-1395 days) in CIA secret detention. This transfer took place alongside the other HVDs in custody at that time, all of whom appear to have been transferred to Guantánamo Bay on 4 September or 5 September 2006. This final transfer was announced by President Bush, as part of a wider disclosure about the CIA’s use of secret prisons. From the time I was arrested five years ago, they have been torturing me. It happened during interviews. One time they tortured me one way and another time they tortured me in a different way. [Redacted]. What else do I want to say? [Redacted]. Many things happened. They were doing so many things. What else did they do? [Redacted]. They do so many things. So many things. What else did they do? [Redacted]. After that another method of torture began. [Redacted]. They used to ask me questions and the investigator after that used to laugh. And, I used to answer the answer that I knew. And, if I didn't reply what I heard, he used to [REDACTED]. So many things happened. Al-Nashiri remains detained in Guantánamo Bay, where charges have been brought against him for the attacks on USS Cole and oil tanker MV Limburg. He has been designated for trial by military commission.